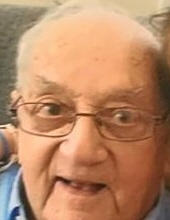 Angelo DiNunno, 94, fondly known as “uncle” to many generations passed away at home on Sunday, January 27, 2019 under the care of hospice and his nephew, Dean and his wife Anne, whom he lived with for the last five years. He was the husband of the late Philomena (Voci)(Croce) DiNunno. Born May 18, 1924, he was the son of the late Donato DiNunno and Francesca (Minerva) DiNunno. Raised in Brockton he graduated from Brockton High School. He served in the United States Army during World War II. Angelo worked for Liberty Printing Company for 62 years. He was a member of the ITAMS, where he once served as Commander. Dean and Anne want to thank Stivens, Amanda, Lisa, Bob and Marybeth and the staff at Brookhaven Hospice for their help, guidance and most of all compassion during the last months. Also Dr. Edward Freccero, Nicole and Shannon for all their help and support during Angelo’s time with Dean and Anne. He is survived by his sister, Ann L. (DiNunno) Smith; he is also survived by many nieces, nephews, grand nieces and nephews and great grand nieces and nephews including Rylee, Jacob, Zachary, Kennedy, Grady and Connor Smith who brightened up his days and helped Nana and Grampy take care of “Uncle”. He was the step-father of Ted Croce and Paula Croce. He was the brother of the late Sabina DiNunno, Paul DiNunno, Sabino DiNunno, Joseph DiNunno and Rose Hayes. Funeral from the Russell & Pica Funeral Home, 441 South Main St., (Rt28) West Bridgewater on Saturday, February 2nd at 9:00AM thence to St. Ann Church, 103 North Main St., West Bridgewater where a funeral mass will be celebrated for the repose of his soul at 10:00AM. Interment will follow in Calvary Cemetery, Brockton. Calling hours Friday 4:00-7:00PM. In lieu of flowers, donations may be made to the Alzheimer’s Association, 309 Waverly Oaks Rd., Waltham, MA 02452. "Email Address" would like to share the life celebration of Angelo DiNunno. Click on the "link" to go to share a favorite memory or leave a condolence message for the family.